A few years ago, online TV guides were just a paperless version of what was arriving in the mail or the middle of Sunday papers. Today, however, as we get closer to the world of TV over IP and video on demand in every home, the space is evolving, giving customers more than they can get in paper. At the same time, advertisers are realizing that TV guides with demographically targeted content present a promising vehicle for delivering targeted ads. Market penetration for these sites is still relatively modest, but it is growing and, as the prospect of not just finding television programming, but also watching it online, becomes more likely, usage will grow exponentially. Just as very few people bother to check the newspaper for movie times at their local theatre, preferring to go online instead, fewer and fewer people rely on the old print version of television listing times. There are just too many benefits to going online. We explain why below. As of today, all sites with guides are free and it appears they will remain so, hoping their targeted content will attract more users and thereby enough advertisers or affiliate sales (think iTunes-like content downloads) to build sustainable businesses. The best features on these sites are those that are moving beyond listings and doing a good job of matching viewer’s interests and habits with programming content. If it sounds akin to online dating sites, well… it is. Your potential matches, in this case, are TV programs. The big win, however, is to link these listings directly to TV over IP content, something that will require industry-level psychological and legal evolution. The companies listed here are the major providers of TV programming schedules online across local, cable, and satellite. MeeVee, Zap2It, and TitanTV also syndicate, making guides available across a number of sites. Individual cable or satellite providers and sites that provide listings in conjunction with hardware/software solutions, like SnapStream, will not be reviewed in this post. 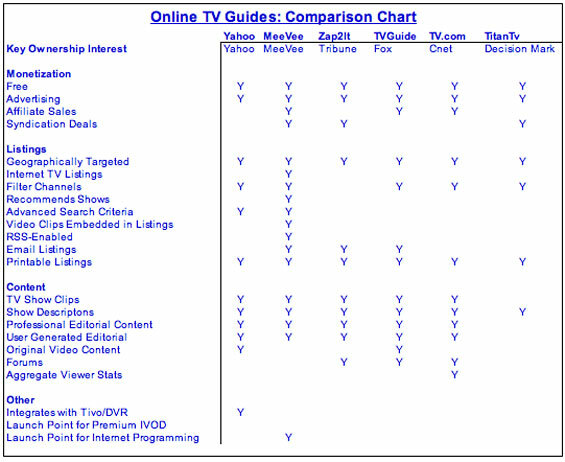 The granddaddy of television programming guides launched on the web all the way back in 1997. Today, TVGuide provides a wealth of original content, some unique to the site, some from print. In addition to editorial content, it hosts a series of blogs from fans. The strategy seems to be aimed at helping you select what to watch through the recommendations of individuals. Listings are available and while offering some category filtering (sports, etc. ), the listing engine itself is pretty basic. Perhaps it’s a bias on my part, but I can’t help thinking that the print TVGuide is, at this point, a bit of an albatross around the site’s neck. I understand leveraging the brand, but it can feel like the goal of the site is to sell print subscriptions, not help online users find the right stuff to watch. MeeVee launched its guide last year. While pursuing a similar strategy to TV guide (helping viewers find TV shows), Like TVGuide, MeeVee lets you search for shows based on actors, subjects (like sharks), keywords, etc. and adds the results to your guide. And it goes further than any of the others – Meevee will then surface shows based on those criteria in the future. Additionally, MeeVee recognizes internet channels in a way its competitors don’t. It might not seem like much now, but the definition of programming (think user-generated video) is starting to extend far beyond cable television channels. If MeeVee can uncover internet-based programming based on user interests, something TVGuide may not be able to do for psychological reasons, it can move ahead of the pack. MeeVee also has direct video content, but its current library is slim. MeeVee needs to expand this content offering and integrate with its strong guide to more broadly deliver on its strategy. Zap2it is owned by the Tribune company. Its site combines listings as well as TV content. It also has content related to Movies and DVDs on its site, as well as movie listings – all of which again suggests a similar strategic theme: “here’s what to watch”. As part of Tribune, there’s some good professional content on this site. It also has some community features which draw some decent traffic. The listings section still feels like paper translated to the web, however. The categorization of programming through color coding is a nice feature, but not groundbreaking. It’s a complete offering, but no single component of the offering blows you away. Yahoo TV is a good combination of content and listings. If you consider Yahoo has a lot of experience in combining content and data (think Yahoo Finance), this isn’t surprising. The listings take advantage of Yahoo’s search technology and enable keyword search to find shows based on interests, actors, etc., but the listings fall short of MeeVee’s in that Yahoo can not be set up to continually surface programming based on these criteria. The content is a mix of proprietary and syndicated. Its new online show “The 9” seeks out the best in web video for the day and works as original web content. In addition, with the ability to program your Tivo through its listings, Yahoo has a solid overall offering. TV.com , a CNET property, stands out for its excellent community content. Reviews, ratings and forums are available to TV.com members. The emphasis on community indicates a bit of a different strategy, making TV.com seem less about what to watch and more about connecting you with those who watch what you watch. The site is usually buzzing after the screening of a popular TV show. If you want listings, you’ll find them here too, but it’s not their strength, community is. TitanTV is owned by Decision Mark, who provides data and software to the broadcast industry. TitanTV is only a guide right now. The guide doesn’t look very good, but it is pretty useful, with lots of color coding to help users distinguish program characteristics. Their search engine falls short of MeeVee and Yahoo, but does allow for more detailed searches of listings than some of its competitors. As a guide, it’s not bad, but there are better and you won’t find much else here right now. We’ve included a summary chart of features below, but the strengths can be summarized as follows: If you want to watch TV content, most of the sites provide clips of shows, previews, etc. If your interest is in editorial content, while quality content is found on most sites, the traditional media outlets have the greatest volume. If you are looking for a strong guide that will help you discover more programming based on your interests, MeeVee is your best bet. If it’s community features you’re after then you’ll be drawn to TV.com. If you want good integration of editorial content and listings, no one totally hits out of the park, but Yahoo TV provides a nice user interface that balances listings and content. All in all, these sites, while certainly better than paper for finding shows and planning your TV viewing, aren’t fully delivering on the real promise of online TV. In this new channel, I want a complete experience, some form of consummation. Until these sites take it a step further and make it easier to experience the video content right after you find it, they are leaving you hanging. Only Yahoo provides some form of consummation with the ability to program your Tivo from its site. MeeVee is taking steps by linking to some internet channels, but more direct connection to on demand, online broadcast (mlb.tv, mobiTv), or even user generated is a necessary next step to really deliver on what could be a really useful service.